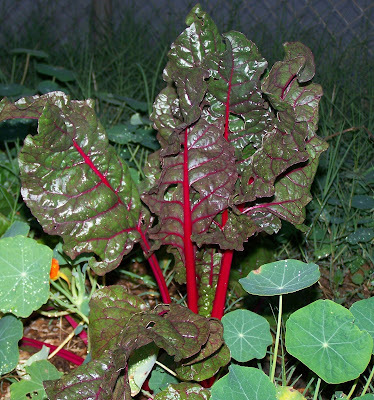 If you are at all like me, there are only so many meals one can take of sauteed or steamed Swiss chard. I like this dish because it is much more than just Swiss chard made limp and eaten. Much more! All ingredient amounts are flexible. This dish might seem to have daunting ingredient list. But don’t be put off; enough of the ingredients will already be lurking in your kitchen. And, if you leave out any one of the spices, it will probably still turn out well. In contrast to some meat tagines, which take hours to prepare and cook, this dish can be made from start to finish on a weeknight. And the flavor is a lovely mélange of spices, slight sweetness from the raisins, and savory flavor from the chickpeas. Serve with rice or quinoa for hearty vegetarian dinner. Add the olive oil, onion, and garlic to a heavy-bottomed Dutch oven or 3-4 quart pot, and turn the heat to medium. Allow to cook for about 5 minutes, then add the paprika, cumin, turmeric, thyme, salt, and cinnamon. Stir together and cook for a minute or two until fragrant. Add the remaining ingredients, cover, and turn the heat down to medium-low. Be sure to stir every 3-5 minutes to ensure that the bottom does not burn and that your ingredients are evenly combined. You can add a tablespoon of rice flour if you like your stew thicker. Remove from the heat after 20 minutes. Enjoy! I just planted Swiss chard for this first time. Thanks for the recipe.